As William, Kate, and George land in Sydney today, they will arrive to a country ready to open them with open arms. Support for a republic in Australia has dropped to its lowest level in three decades, with more than half of Australians in favour of keeping the royal family as heads of state. According to a Fairfax-Nielsen poll, 51 percent of Australians believed the switch to a republic was unnecessary and only 42 percent were in favour of a republic. This is down from 58 percent in favour of a republic in 1999, when a referendum on the issue was held, and represents the lowest ebb in pro-republican sentiment in the country in 35 years. 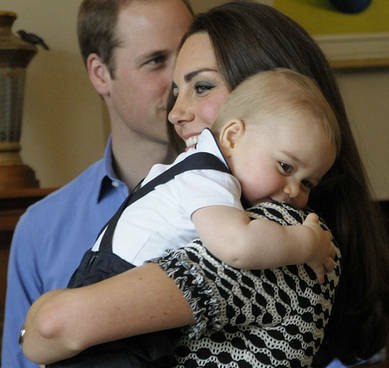 The Duke and Duchess of Cambridge, and their son Prince George, are thought to be responsible for the resurgence of support for the monarchy. Prince George was dubbed 'Prince George the Republican Slayer' on Australian breakfast television on Wednesday. The survey found support for the royals was at its highest among Australians aged 18-24, 60 percent of whom thought Australia should keep its royal head of state, and only 28 percent supporting a transition to a republican system of government. However, a majority of Australian voters support Australia becoming a monarchy eventually. According to the poll, only 35 percent believed Australia should 'never' become a republic. Most Australians believe the nation should become a republic either 'as soon as possible'(28 percent) or 'after Queen Elizabeth's reign ends' (31 percent). However David Morris, national director of the Australian Republican Movement, remains hopeful that one day the Australian head of state will be an Australian. 'We shouldn’t jump to conclusions based on one poll that’s held in the middle of a media frenzy about a huge celebrity royal visit,' he said. He added that support for the monarchy was due to the celebrity status of Will and Kate, as well as the fact there has been no broad political debate on the issue in over a decade. Prime Minister Tony Abbott, who was an ardent defender of the monarchy in the lead up to the 1999 referendum, announced last month that he would be reinstating the titles of knights and dames for 'pre-eminent Australians'. However, only 35 percent of Australians are in favour of bringing back the titles, according to another Fairfax Media poll.